The citizens of Cameroon today celebrated the 40th anniversary of the their Republic. National Day is a holiday in Cameroon celebarated on 20 May. For the citizens of Cameroon, the National Day indicates honor and pride. Reports say complete Independence was not granted to a largely colonized Cameroon till 1972. On May 20 1972, the constitution of the United Republic of Cameroon was adopted by the Union Nationale Camerounaise headed by President Ahmadou Ahidjo. who abolishment the federal system of government and created unitary state. US Secretary of State Hillary Rodham Clinton sent her best wishes to the people of Cameroon as they celebrate anniversary of the Republic. She states that both countries are partnering together to address issues of democracy, good governance, and economic development. U.S. companies are investing and expanding their activities in Cameroon, she added. According to Secretary Clinton, the U.S. Agency for International Development (USAID) is assigning two Americans to work on a range of development projects, including a new $16 million Food for Education program in Cameroon’s Far North Region. The United States supports efforts to strengthen electoral institutions, enhance transparency and allow for contestation of results. On 2003, the U.S. Department of Agriculture (USDA) provided a commodity grant valued at $6 million to fund agricultural development projects in the North and Far North provinces. In 2004, US approved $4 million worth program that will fund an agricultural development and nutrition enhancement project in the East and Adamawa provinces. 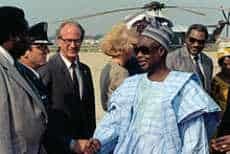 Ahmadou Ahidjo arrives at Washington, D.C., in July 1982. The United States and Cameroon work together in the UN. In the UN Security Council in 2002, Cameroon worked closely with the United States on a number of initiatives. The U.S. Government continues to provide funding for international financial institutions that provide financial and other assistance to Cameroon.